You know how Chris Ward is awesome? You guys aren't talking about me and I'm still hanging on his every word. Marvelous. Now just imagine if I had something intelligent or insightful to say! me miss my radio days. Who won the pumpkin contest? I hope it was Spock. The Chris Ward Experience wrote: Captain Painway won! I forgot who it was around here with the redhead fetish, but that may have just broken their heart(s). I wouldn't call mine a fetish, just a preference. I loves me some fire pie. Did you kiss Princess Minnie with that mouth? 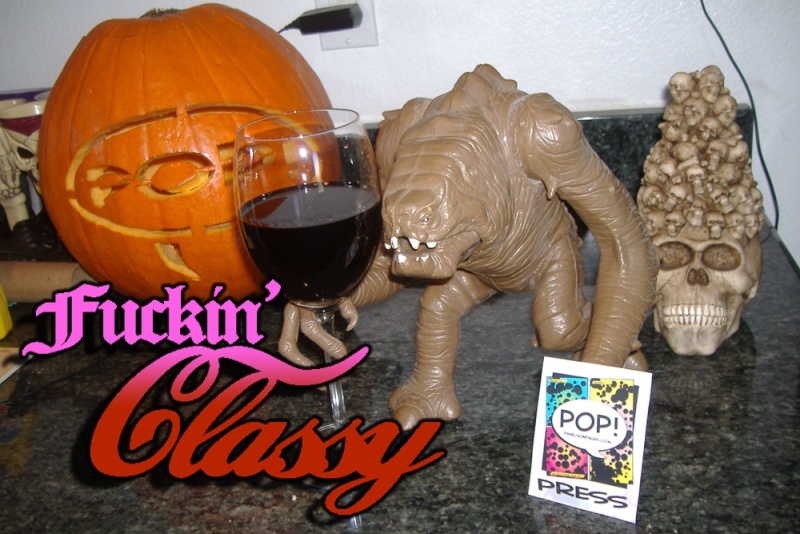 Man we gotta get Larry or Frozen to draw up a Classy wine glass swishing Rancor. Possibly with a tiny monocle. My hair wasn't even red in that picture, it's reflecting the accent lights. Shortly after the picture was taken, I dyed it red, but I make a terrible redhead. I've been dying it various shades of red off and on since I was 15, since I too have a redhead fetish. I just look like crap with red hair. Here is what it looks like dyed back to brown, and after I cut it really short. That was a big mistake, but it's growing back very quickly. Ignore the stupid pose. It was a roller derby afterparty, and I was really, really drunk. I made a new year's resolution to check out the local roller-derby team more often (and hopefully they, me ), but my schedule always seemed to conflict. Roller Derby Girls are fun to party with. Kind of like the PoP! Princesses. Only bruisier. Hey folks--who are the hosts of the show? I know it's Lee Rodriguez, Tripper McGee, Jason Kerouac, and then there's one other name I didn't catch. Any help? That'd be the esteemed Jason Knize, Mr Collins. 26 Re: The Panels On Pages PoP-Cast!